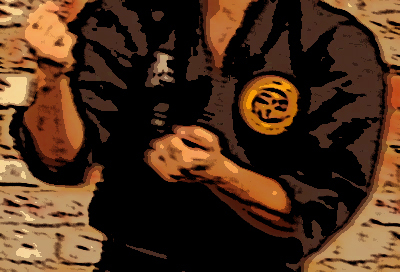 Music get’s a bad rap (no pun intended) in traditional martial arts circles. And, let’s face it, training to defend your life is a serious business and not a place for distractions. With the advent of musical kata competitions, and the mixing of breakdance moves with martial arts, it is no wonder that traditionalists get their feathers ruffled. Music is also used heavily in martial sport training, from boxing to MMA. We are all familiar with the image of a pumped up athlete, pumping out repetitions to a strong rock beat. On the other hand, the traditional dojo is a contemplative, sometimes spiritual place, where students train hard, think hard, and get in touch with their inner-selves. But, there are sounds in the dojo, from the yells, to the scuffling feet, to snapping gis and, of course, the teachers voice. Music might be a distraction in such an environment but, when training alone, it can be useful to fill the void. One of the hardest parts of solo training is admitting that you are not always completely focused. No matter how serious your intentions, sometimes your mind wanders. In the dojo, you forget your mind in the presence of others. Alone, it is harder to escape your thoughts, and many people choose not to train on those kinds of days. But it is exactly those kind of days when you have to press on and break through your mental doldrums. If you aren’t careful, those “I don’t feel like it today” days start popping up more and more often. A big part of the “wandering mind” syndrome is the relative quiet of training alone which is why music can be a valid training tool to help with focus. The key is to remember what the goal of the music is: to create energy and atmosphere that quiets the mind and gets the body moving. I find certain music mimics having someone else in the dojo. Instead of being alone, I am surrounded by another presence and I tend to train with more emphasis and focus. Be sure and choose your playlist carefully. There are certain problems in practicing instinctive movements while listening to an even rhythm. Some types of pop, rock, and hip hop have such dominate rhythms that it is hard not to move with them. The same can be said for songs with clear and evocative lyrics that make you stop and think about what is being sung. I like fast paced rhythmic music that also has and underlying continuous “gray noise” such as heavy rock guitar. I like expressionistic singers who are either unintelligible or singing about vague and ambiguous subjects. Recently, when I find a song, or band that works, I create a Pandora playlist based on that, and let things go from there. One final thought. Some martial artists have suggested traditional Asian music is a good background. Others like new age or world music that speaks to the contemplative side of training. I don’t have a problem with either of these but they don’t create energy; they create ambiance. Be aware of the difference and don’t be afraid to try out some good old noisy rock the next time you are not in the “mood” to train. I just don’t want to be around when the cannons go off! I am one of those people who used to love working out with music. However I do not use music for anything these days and I still get the same results. For me, the music helps to quiet my mind when my thoughts are getting in the way of a productive training session. It sounds as if you have other ways to stay focused. If you think they would be useful to others, feel free to share. Thanks for reading and for the comments. I talk to myself a lot while training. Especially when I’m getting tired. I do this mentally though and only rarely do I actually utter the words. Another thing I do is pretend I am in a fight. It doesn’t matter if it’s cardio, endurance, or sparring, I am always in a fight mentally. That helps me continue performing even when my energy is completely depleted.On the flip-side, this has helped me in real fights because I am always so relaxed and don’t even think of fatigue. That works for me though, who knows maybe someone reading this will benefit from it too. That all sounds effective. Thanks so much for sharing.